Just because we don’t see the snow here in Shenzhen, doesn’t mean that we shouldn’t celebrate the festive season! 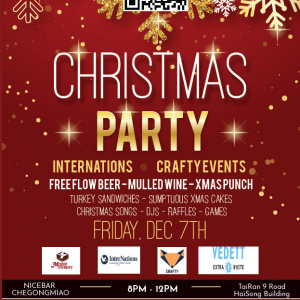 Therefore, InterNations is throwing this festive season's BIGGEST PARTY for our amazing crowd of followers. Heaps of entertainment to get you into your favourite Christmas jumper, free flowing drinks including hot mulled wine, Vedett white, Christmas punch, festive food such as turkey and cranberry sandwiches, plus a Christmas Goodie Bag on arrival for the first 100 guests waiting for you. We aim to fill the room with music, laughter and festive cheer with special performances and raffles with some truly amazing prizes!